CERAMBOT is a delta style 3D printer that extrudes semi-wet clay (or ceramic) that can then be annealed in a kiln. It comes in two kit configurations: a worm-gear plunger (Pro Extruder) or an air extruder kit that requires an air compressor that’s not supplied. 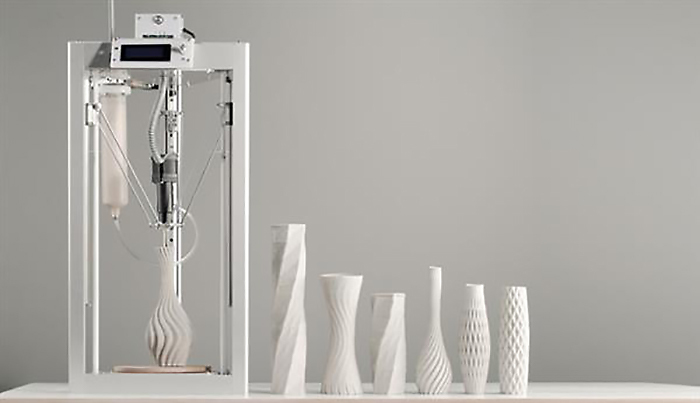 Design of the 3D printer provides mechanical accuracy to 0.1mm while nozzles ranging from 0.8 to 1.5mm can extrude layers as thin as 0.4mm and as thick as 2mm. The CERAMBOT can extrude any clay-like material with a viscosity of toothpaste. There are even some clays that don’t require baking. The delta design and 1.5mm layers allow for parts to be 3D printed in minutes rather than hours. The first lucky 100 supporters secured their CERAMBOTs with the Pro Extruder for $299, but there are still plenty left between $329 and $369. Air versions are available for as little as $199! There are a few $99 Pro Extruders available as well. This entry was posted on Thursday, November 15th, 2018 at 8:58 am	and is filed under 3D, printer, technology.